After a couple of weeks of leaks and rumors, Creative offically announced the ZEN X-Fi and the ZEN X-Fi With Wireless LAN. 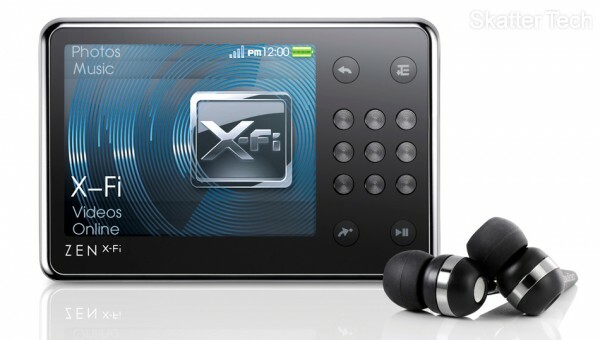 And as implied by the title of the second product, owners of the X-Fi w/ WiFi will have the ability to Stream and Download music, photos, and videos from their home networked computers. The Zen X-Fi looks quite similar to the ZEN, which we reviewed last year, but it now has tons of new features and hopfully has resolved all the shortcomings of it’s predecessor. In addition to the new WiFi hardware component, the Zen X-Fi now has built-in speakers, a SD card reader, built-in FM radio, and a microphone for voice recordings. With a 2.5-inch TFT display with the ability to playback WMV, AVI, MJPEG, MPEG4-SP, DivX 4 and 5 and XviD, the player should satisfy the needs of most customers. As for audio, the unit supports playback of unprotected MP3, WMA and AAC audio formats. Creative also bundles in a set of high quality EP-830 in-ear earphones, which are much better than the standard sets of headphones that usually come with most digital media players. The ZEN X-FI with Wireless LAN 32GB and 16GB models are now available for $279.99 and $199.99, respectively. They are now available for purchase through online retailers including Amazon.com, Buy.com, Creative.com, Fry’s.com and Newegg.com. The standard ZEN X-FI 8GB (without WiFi) will become available later this month for $149.99.